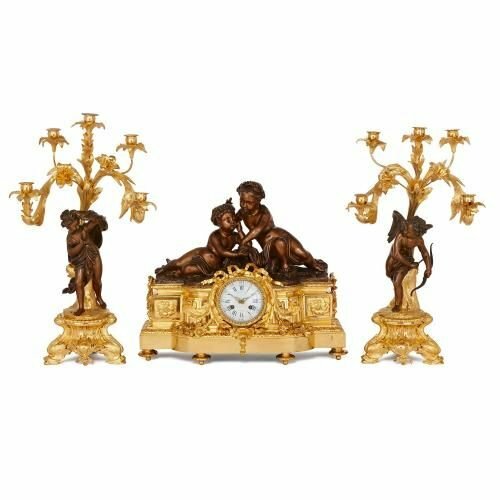 This elegant and sculptural clock set, by the prestigious French maker Picard, demonstrates exceptionally intricate workmanship in gilt and patinated bronze. 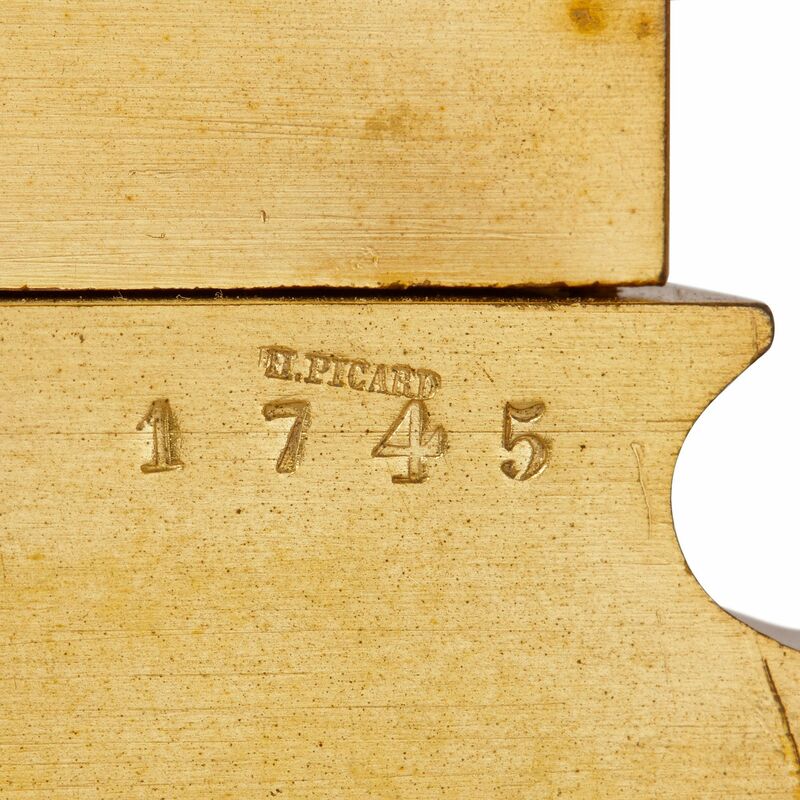 French maker Henri Picard (fl. 1831-1864) was one of the most respected and revered bronze fondeurs of the mid-19th Century. Here we have a magnificently-designed clock set, made in collaboration with the prestigious clockmakers Raingo Freres, showcasing the exceptional attention to detail for which Picard was famous. The set comprises a central clock and a pair of flanking candelabra, all similarly decorated with patinated bronze cherub figures on ormolu supports. 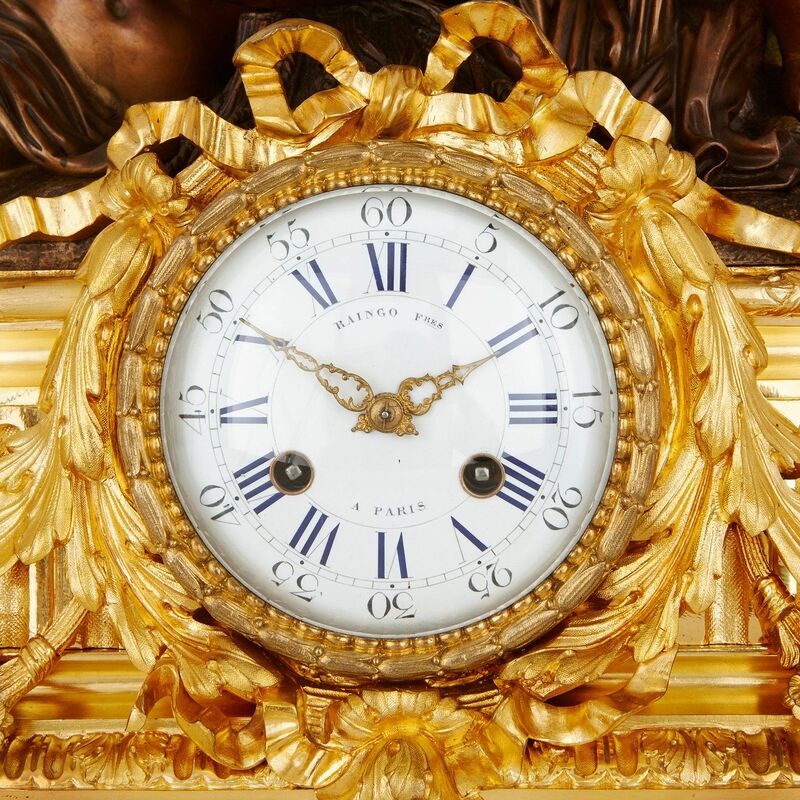 The central clock takes the form of a rectangular plinth with two reclining cherubs above: the plinth is decorated with intricate, Neoclassical-style motifs including ribbons, acanthus leaves and floral garlands, all set on toupie feet. The enamel clock dial is mounted to the centre of the plinth, and is signed 'Raingo Freres / Paris'. The pair of flanking candelabra also feature graceful full-length cherub figures, one of which is cast with a bow and arrow and the other in draped clothing. 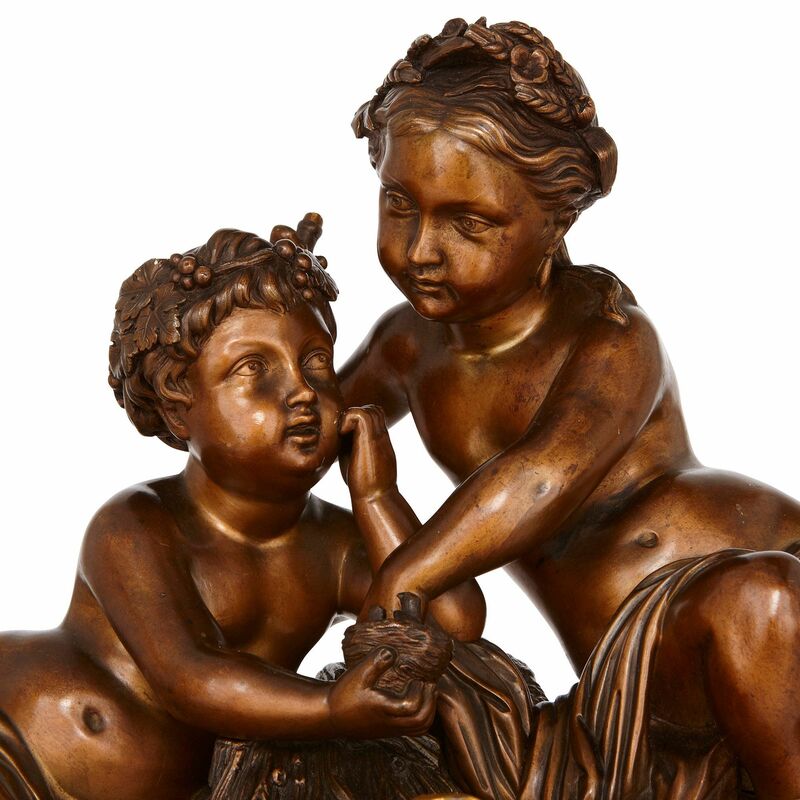 The cherubs are shown standing on circular ormolu plinths, which each sit on three feet, shaped to resemble dolphins' heads. 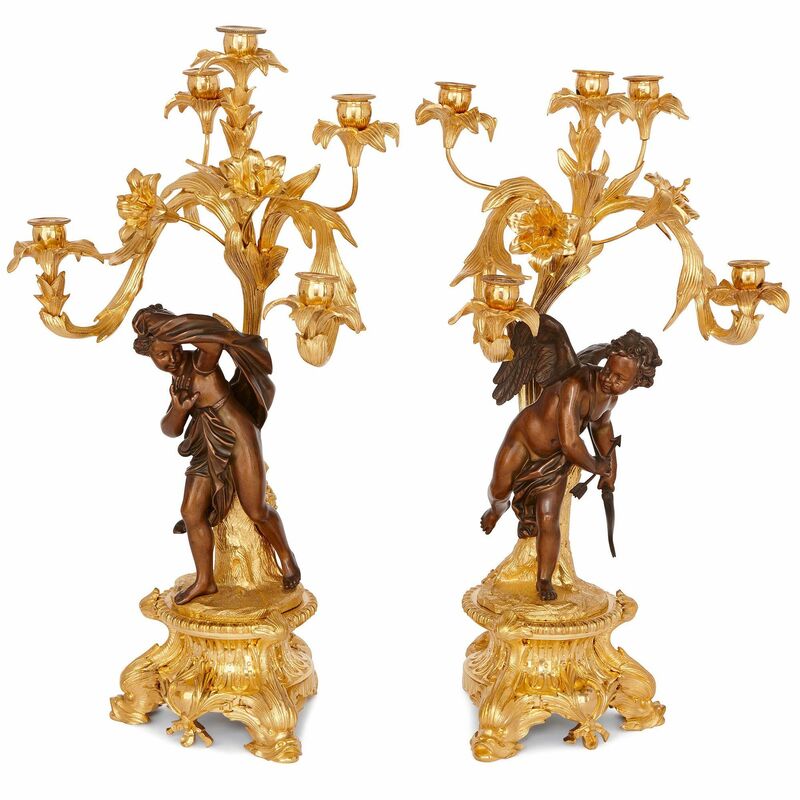 Each candelabrum features a central scrolling ormolu branch, rising from the base and behind the cherub figures, leading to the five candle lights, shown issuing from scrolling leaf-form arms.